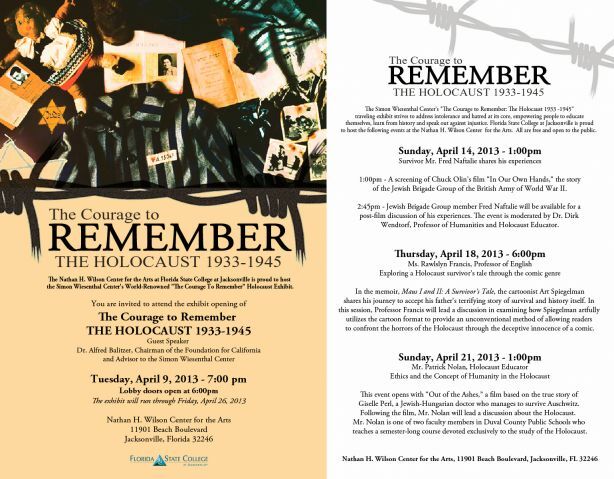 The Courage to Remember: Simon Wiesenthal Center's World-Renowned Holocaust Exhibit opens April 9 at FSCJ South Campus Wilson Center. Guest speaker: Dr. Alfred Balitzer, adviser to Simon Wiesenthal Center and chairman of the Foundation for California; exhibit to run through April 26, 2013. Exhibit: continues through April 26. COST: Free and open to the public. No reservations required; seating is limited for opening ceremony. DETAILS: The Simon Wiesenthal Center's "The Courage to Remember: The Holocaust 1933-1945" is a traveling exhibit that strives to address the issues of intolerance and hatred at the core, empowering people to educate themselves, learn from history and speak out against injustice. The exhibit is available for viewing at the Nathan H. Wilson Center for the Arts at Florida State College at Jacksonville from April 9-26, 2013. The exhibit will commence with an opening ceremony on April 9 at 7 p.m. Hosting the opening will be FSCJ Interim President Will Holcombe, Ph.D., with Duval County Public Schools Superintendent Nikolai Vitti, Ph.D. Guest speaker for the opening ceremony will be Alfred Balitzer, Ph.D., Chairman of the Foundation for California and advisor to the Simon Wiesenthal Center. "The Courage to Remember [exhibit] empowers young and old to learn from history, confront bigotry and fight for justice,” said Dr. Balitzer. “This exhibit is not a luxury; it is a necessity in all communities." The Courage to Remember exhibit is produced by the Simon Wiesenthal Center's Museum of Tolerance; presented by the Foundation for California; and made possible by a grant from SNCF. It has been displayed in over 16 countries over the past 20 years, in addition to a successful tour throughout California and the Southeast. More than 350,000 people have seen the exhibit in California alone. The exhibit features more than 200 exclusive photographs that cannot be seen anywhere else in the world. It offers amazing insight into the Holocaust through four distinct themes: Nazi Germany, 1933-1938; Moving Toward the "Final Solution," 1939-1941; Annihilation in Nazi-occupied Europe, 1941-1945; and Liberation, Building New Lives. "Two decades after we first designed this exhibit, its lesson is still vital to peace at home and abroad," said Rabbi Abraham Cooper, Associate Dean of the Simon Wiesenthal Center. "Its timeless messages reflect the words of Simon Wiesenthal: 'Hope lives when people remember.'" In 1983 the United States Congress established the Days of Remembrance as a national annual commemoration of the Holocaust. Congress also created the United States Holocaust Memorial Museum as a permanent living memorial to the victims. Holocaust Remembrance Day is April 8, with Days of Remembrance being observed April 7-14, 2013.